Alex Heath / Business InsiderAbout 20,000 Pokémon Go players travelled from all corners of the world to Chicago’s Grant Park last week for an event that quickly turned into a disaster. Niantic, the company behind smartphone game “Pokémon Go,” has been hit with a proposed class-action lawsuit over its troublesome event last week in Chicago that attracted 20,000 Pokemon Go players from around the world. 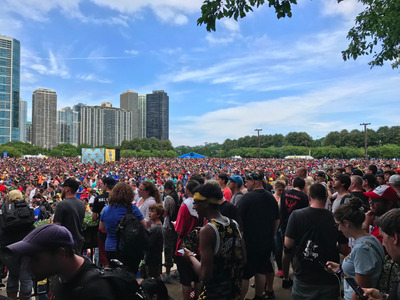 The “Pokémon Go FEST,” the first event of its kind, was billed as a chance for thousands of gamers to meet and catch rare pokémon in a live setting. But it was marred by queues to get in and technical issues that left some attendees unable to play the game or access the internet. Business Insider’s Alex Heath got pictures from inside the event and detailed the issues first-hand, including problems with the game’s server, which started to buckle under the pressure of so many players in one area. Niantic subsequently apologised to angry fans and refunded attendees for their $US20 tickets. Niantic did not immediately respond to Business Insider’s request for comment outside of US business hours. On Saturday, the company announced that it was postponing European events due to be held in August “until a date later in the Fall.” There were events scheduled for August 5 in Copenhagen and Prague, and for August 12 in Stockholm and Amsterdam.